Food insecurity continues to be an issue in nearly every community in America. It’s estimated that one in eight Americans and one in six children lacked consistent access to affordable and nutritious food in 2017. That’s why fighting food insecurity is a top priority for the Gene B. Glick Company. Glick Cares, the Glick Company’s corporate volunteer program, hosted a volunteer event on Oct. 13 at Gleaners Food Bank in Indianapolis. The Glick Cares team of 22 employees and family members spent the morning assembling BackSacks: Weekend Food for Kids. BackSacks exist to cover the meal gap over the weekend, when school meals aren’t available. Each BackSack is put together with enough food for seven small meals and approximately half of a child’s weekend needs of calories and protein. In total, the Glick Cares team assembled 714 BackSacks that will go to food insecure children within Gleaners’ 21-county service area of central and southeast Indiana. Gleaners distributes around 8,500 BackSacks per week to help children with the weekend meal gap. Check out the highlight video from the Glick Cares volunteer event at Gleaners here. Collected over 16,000 canned food items. Items were then distributed to food pantries at Glick properties around the country. Packed over 24,000 meals with Million Meal Movement. Meals were then distributed to food pantries at Glick properties in central Indiana. Served over 8,800 meals at Glick properties around the country through the Summer Servings Food Service Program. 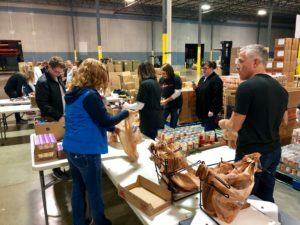 Each quarter, Glick Cares hosts a weekend volunteer project for Glick team members and their family members to give back to the central Indiana community, where the Glick Company is headquartered. These family-friendly events are a great way for employees to teach their children and grandchildren about the impact volunteering has on the community. Glick also provides all team members with eight hours of paid volunteer time off each year – known as VTO – so they can engage with organizations near and dear to their hearts. Gleaners is leading the fight against hunger in central and southeast Indiana. Since its founding in 1980, Gleaners has distributed over 360 million pounds of food to nearly 600 hunger relief agencies serving Hoosiers in need. Gleaners is part of Feeding America, a nationwide network of 200 foodbanks that provides food for more than 46 million people annually.